COULD these pint-sized poddy riders lead Queensland's next tourism revival? If the reaction of the British backpacker watching them at Rockhampton's Great Western Hotel this week is anything to go by, they should certainly be front and centre in the next TV campaign. With mobile phone out, the young woman next to me could not believe what was unfolding at the local pub. Those coming to get a drink or a steak at the Beef Capital establishment were served up a program of poddy riding featuring some riders no higher than a cowboy's belt. These are Queensland's future rodeo guns. They, and their parents, take their induction into the ring very seriously. Some riders putting on their training wheels for the first time with dad in the ring next to them can be as young as three or four. Dads race out beside them, holding onto the rider as the young calf tries to unload. They normally don't last too long in the saddle - just seconds - but they soon get the taste of the adrenaline rush of man versus beast and will no doubt be back for more. Some of the older riders are incredible to watch, breaking the eight second timer as they hold on for glory in front of the beer-swilling crowd. 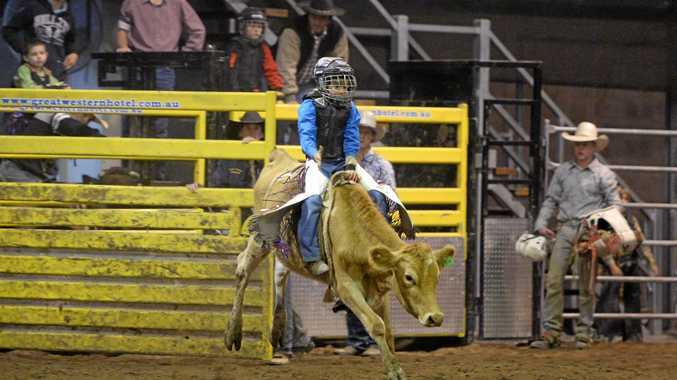 Poddy riding is normally for young cowboys aged eight to 13 just starting out in their rodeo careers. Similar to bull riding, the rider is strapped down to the poddy with one hand using a bull rope. As the riders emerge from the gate, the MC of the night urges them to sit up tall and hold on tight. Another older rider came off hard and limped away from the bull. But no doubt he will be back for the glory of the buckle and the adoration of the crowd. And it's not just the boys vying to be Australia's next bull riding champion. Gracemere's Caydence Fouracre recently became the only female to be representing Australia in the Youth Bull Riders World Finals. The eleven-year-old Caydence spoke to The Morning Bulletin earlier this year in the middle of preparing for her big trip to the United States. Her father, Rod Fouracre, is a former bull rider who had also competed on rodeo circuits in the region. She won the 2017 Top Gun Series at the Great Western Hotel. Caydence first hopped on a poddy at an Australia Day event at the age of four.